Diesel mechanics and repair technicians are currently enjoying a job market with robust growth potential, job security and excellent compensation. This is especially true in the state of Michigan due to its central position in America’s road and rail infrastructure. Diesel mechanics maintain, repair and diagnose various types of diesel engines. In most cases, diesel mechanics work on automotive diesel engines, including those used in commercial trucks, private cars and construction equipment. 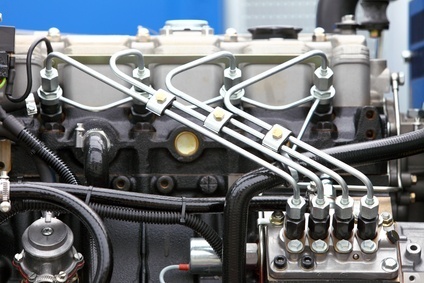 Because modern diesel engines make extensive use of electronic components, modern diesel mechanics must also be able to use computer diagnostic and repair equipment. Depending on their particular job, a diesel mechanic may be tasked with working on one single aspect of a diesel engine or, especially if they are the only mechanic on staff, be expected to handle all aspects of a diesel engine’s repair. In addition, the equipment they use will depend on their place of employment and the nature of their duties. In addition to car and truck engines, diesel engines are used to power trains, private and commercial shipping, power plants, and a variety of small appliances. In most cases, working on these engines requires specialized knowledge on the part of the diesel mechanic. For example, mechanics who work on diesel generators are often expected to be capable of safely maintaining the generator, in addition to the diesel engine that powers it. Marine diesel mechanics, especially if they are expected to be part of a ship’s crew, are also expected to know the basics of marine engineering and how to work safely while at sea. Because of this, diesel mechanics seeking employment in these areas have usually received specialized training when compared to traditional diesel mechanics. What Type of Training is Required for Diesel Mechanics? Michigan does not require licensure of diesel mechanics, although general employment regulations ensure that most businesses will only consider individuals who are 18 years or older and who have received a high school diploma or graduate equivalency degree (GED). However, those individuals who wish to maximize their employment options usually seek out a program of formal training in the field of diesel repair. There are a wide range of diesel repair programs available from communality colleges, vocational schools and some adult education programs. In addition, some private employers offer training for qualified employees. Depending on what these programs cover, they can take anywhere from six months to two years to complete and usually confer a certificate of completion or associate’s degree upon the successful graduate. In most cases, these programs train the student in how to diagnose and repair modern diesel engines, using the full range of diagnostic techniques, ranging from computer systems to the mechanic’s own eyes. In addition, these programs train the mechanic in the underlying principles of diesel engine operation, enabling him or her to effectively work on all types of diesel engines. Most schools offer both part and full-time course schedules. While it will take longer for students on a part-time schedule to complete the program, a part-time student can continue to work or care for his or her family while preparing for a career as a diesel mechanic. In addition, many programs offer some or all of their classes online, which can allow the students to work from home, avoiding the need to travel to a daily class at the school. However, some schools will require that their students physically attend hands on instruction sessions and examinations. Many diesel mechanic programs cover other aspects of engine and vehicle repair, ranging from emission control system maintenance to frame, brake and transmission care. Although these fields are not directly related to diesel engine repair, becoming skilled in these fields can improve a mechanic’s job prospects. In addition, many mechanics seek to become certified by the National Institute for Automotive Service Excellence (ASE), which provides certification in a number of specialties, ranging from electronic control systems, to emission control systems. An ASE certification indicates that the mechanic has attained a high degree of proficiency in his or her field and can dramatically improve the individual’s career prospects. Currently, according to the Bureau of Labor Statistics (BLS) there are over 242,000 diesel mechanics currently working in the United States. That number is expected to increase by at least 15 percent between until 2020. When combined with the fact that a number of currently employed diesel mechanics are expected to leave the field due to retirement and other factors, this indicates that the job prospects for newly trained diesel mechanics will continue to show robust growth. Furthermore, the current national median salary for diesel mechanics is nearly $41,000. Experienced diesel mechanics or those in high paying careers earn considerably more. In addition, due to the importance of having effective and experienced mechanics on staff, most businesses that employ diesel mechanics offer a high degree of job security. With over 7,000 diesel mechanics involved in bus and truck repair working in Michigan, not including those mechanics working on ships, private cars, and other diesel engines, this field presents excellent job and salary options for Michigan citizens. Ultimately, becoming a diesel mechanic provides an individual with a dependable and well-compensated career. Because of this, newly graduated students, as well as those who are seeking a more rewarding career, should strongly consider becoming a trained diesel mechanic. Especially given Michigan’s history of dependence on road transport, this is a field that will remain an excellent choice for the foreseeable future.